One of the most unique features of eTrac for lenders is that you get to choose how to maximize your process efficiencies by customizing your own unique workflow within the system. Not only can you map out your own individual process flow – complete with notifications and alerts – you can also utilize eTrac to manage your own appraisal panel or multiple AMCs that manage the process for you. No matter what type of business model your organization follows, eTrac is guaranteed to provide an efficient workflow. 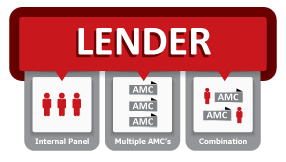 For lenders that utilize multiple AMCs, eTrac can be automated to perform specific types of appraisal assignment rotation styles based on loan types, regional areas, or percentage of business allocations.